Let’s see what that is like. 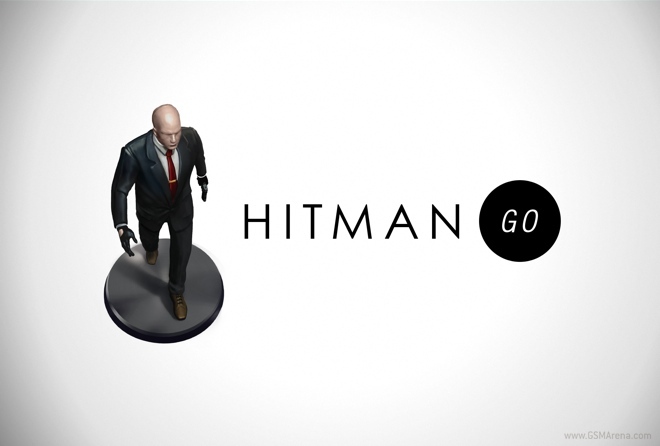 As mentioned before, Hitman GO is nothing like other Hitman games. The game is presented in the style of a board game with multiple levels within each board game. Within each level, you will find diorama-style set pieces with all the characters basically being tiny models. 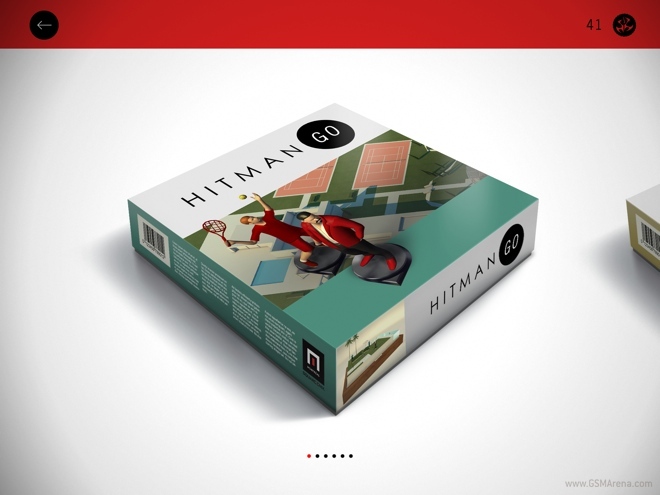 You control Agent 47 around the board within the marked grid with set points. You slide him on the board to move him to the next point around him and can only move one point at a time, which counts as one move. After you move, the enemies around the level also move. If you move within their range (one point in front of them) or if you happen to be in their range when they move, they will take you down and the level restarts. Alternatively, you can take down your enemies by moving into them from the side or the back. Most of the levels have multiple goals. Along with completing the level, you sometimes have other goals, such as finishing it a certain number of moves, or by not killing anyone, or collecting the optional suitcase in some of the levels, etc. The more goals you complete within a level, the more points you get, which later help you unlock additional levels. The initial levels start off pretty easy but the game turns up the difficulty pretty soon. Initially, it’s just the additional goals that are hard to collect but eventually simply reaching the end of the level itself becomes a challenge. Thinking ahead and observing your enemy movement patterns is the key to reaching the goal without running into anyone. Eventually, the game gives you additional items, such as distractions that you can throw to direct your enemies elsewhere, and weapons. 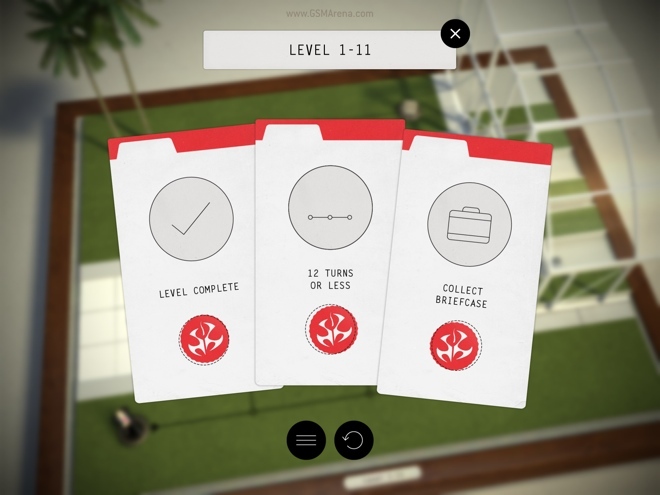 The game has a hint system that basically tells you step by step how to achieve each of the goals in a level. The game comes with five hints by default and you can purchase additional ones using the IAP system. You can also unlock levels by paying for them. 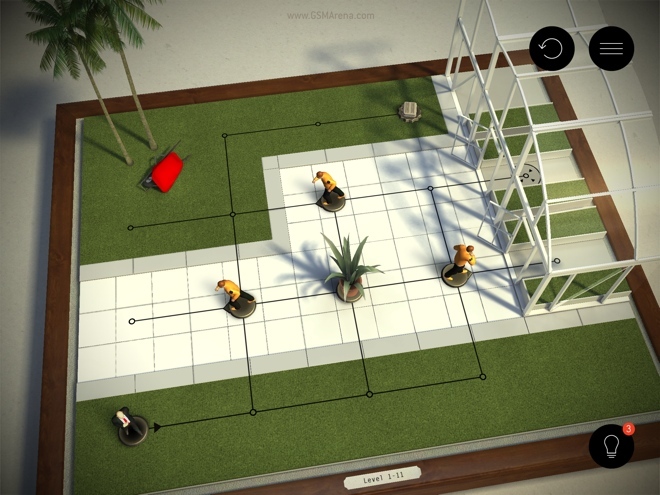 Visually, Hitman GO is very impressive. The levels are all in 3D and are really nicely designed. You can also see elements such as trees and lampposts sticking out of the board. The textures on the models are also excellent and they have that telltale plastic look to them. Overall, it’s all very nice and looks great especially on the iPad’s Retina display. Sound-wise, too, the game is very good. The music in some of the levels is actually quite nice and even the sound effects, such as the sound of crickets in the night levels, etc., are very well done. The sound, like the visuals, has a level of polish that one expects from a game from a big studio. 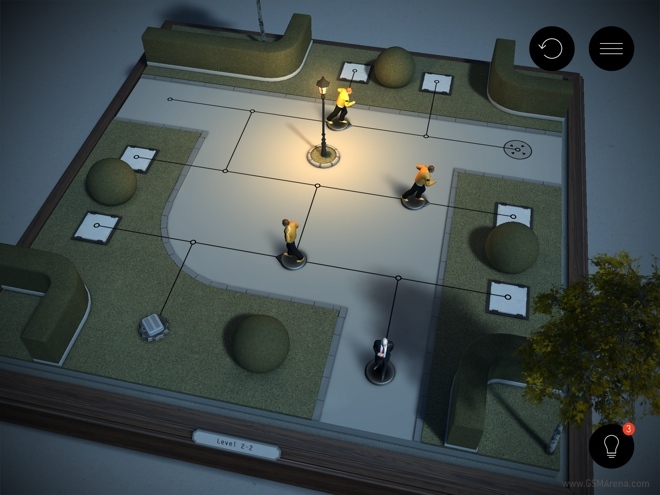 I was very impressed by Hitman GO overall. It is a very novel concept and it is executed very well. The game is fun and challenging and there are plenty of levels to keep you busy for hours. Even visually, the game is very impressive. There is not a lot here to complain about and if you have an iPhone or an iPad, you should definitely check this game out.